After attending their conference the past few years, I finally had the privilege of attending the Plywood Retreat last week. This intimate event is limited to about a dozen attendees, and helps entrepreneurs pursue business dreams in very practical ways. Due to the size, we are able to stay at a lake house and enjoy the natural surroundings most of us don’t get to see very often, rather than be in a typical conference room or in-town auditorium. There were many things I appreciated about the event, but in particular, I love how they try to create a tailor-made experience. Before arriving, we had to fill out an application and go through an interview to make sure we were a right fit for the retreat, which is aimed at mostly social enterprises who want to do positive things in the world, on both the for- and non-profit sides. We were all also in the early stages of business—less than two years, I think. Then we had a phone interview with the founder, Jeff Shinabarger, and he took a bit of time to get to know us as individuals and our thoughts/needs/wants for our business. But, this way, we weren’t walking into the retreat having to introduce ourselves and our goals. The staff already had a good understanding of us, and we could hit the ground running. These things add up to a couple of other very important customizations. First, they choose the speakers based on us. I think some of them overlap from retreat to retreat, but they also like to bring in folks who can lend unique perspective to our particular areas. So, we had speakers not only on finance, goals, marketing and branding, which most everyone could learn from, but also had one, for example, on donor expectations and insight for those in the non-profit sector or who need to raise capital. One of the highlights, and the most individual-centered aspect, was the mentor dinner. We went off-site to a restaurant and sat at a table with someone they chose specifically for us. I had a fantastic meal with Jennifer Schuchmann, a local author who also has a background in other forms of writing. She was awesome. She was able to answer very high-level and very practical questions I had, as well as work through a few things I couldn’t quite put my finger on, but knew I needed to clarify in my work. This was really special, and I think everyone felt the same. But before I go, I wanted to introduce you to my fellow retreaters. They are doing some really wonderful things you should know about. Categories: Learn, Social Justice | Tags: business, business retreat, plywood people, plywood retreat, small business, social enterprise, social entrepreneur, social innovation | Permalink. 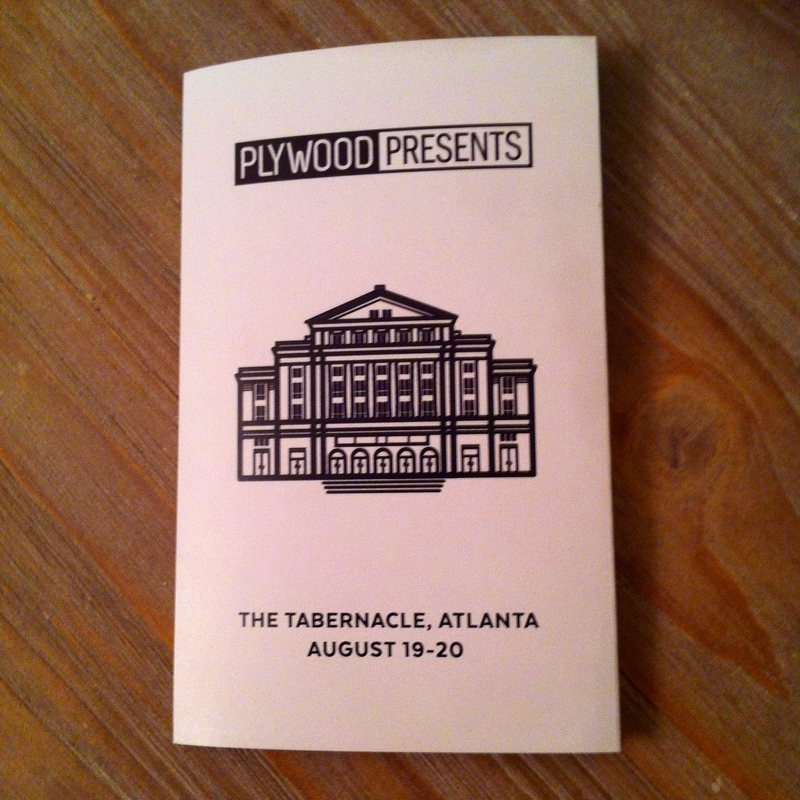 A couple of weeks ago I sat in on another great Plywood People event. I always love seeing what they’re up to. And currently, they’re working on a curriculum for social entrepreneurs to be released at their annual event in August. It’s going to be great! So, a few friends and I showed up to be audience members, and were able to hear from a number of experts on character and building a business. Don’t just tell people your story, create a way for them to be a part of it. Map out your conversations if you’re making an ask. Make the ask about them, not you. Make a small ask, then a bigger one. Start small with people and get them in the door. Ask friends and family for connections. Events build momentum and show people you can get stuff done. It allows them to have an emotional connection. To invite people in, and make it relatable to them. You cannot innovate by committee. Bring in few decision makers. Your principles are your boundaries. Solve both current and future problems. Find people with the skills who both compliment and supplement yours. Multiple voices make a better project. Define what’s special about your project, and protect that. Think less about what your doing, and think about what you want to be. Love your neighbor. Love the person in need along your roads. Don’t take over a space in which you are trying to help. Provide dignity for those you are helping, or an exchange. To evaluate your program, ask those who have gone through it first-hand. If you’re getting bored on a project, bring in other voices to breathe into it. Don’t let it go stale. There’s a big difference between ending something and quitting something. Your failures don’t define you, they prepare you. Ask people, “What do you love about what you do?” instead of what they do. Community keeps you grounded and on mission. Define your mission before someone defines it for you. Every person deserves to be celebrated. Use the lows as learning opportunities. Take care of your fans, so that it creates a gravitational pull for them to come back and bring others. Be a friend, not a fan. Think about the “wake” you leave behind you. Choose people who embrace your culture first. You can teach skills late. Promise makers need promise keepers. First ideas. Then a plan. Finally, put it on your calendar. To make it real you need to get it on paper. Have a plan for quitting so there is no impulse decision. I am not my business, and my business is not me. Categories: Learn | Tags: andy levine, Brad Montague, callie murray, doug shipman, leroy barber, plywood people, ryan gravel, social entrepreneur | Permalink.